Bologna attraction-guides.com - Bologna, Italy attractions guide Bologna Orto Botanico (Botanical Gardens) information about attractions, history, medicinal herbs, largest park, plant collections, location and address, tel / telephone number, general tourist information about Orto Botanico (Botanical Gardens) in Bologna area, Italy (Italia) IT - Last updated 30/10/2012. 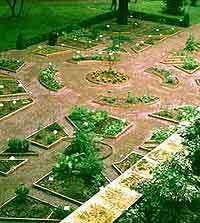 The beautiful Orto Botanico (Botanical Gardens) in Bologna are full of history and were originally created during the mid 16th century, when many medicinal herbs were grown here. Over the years Bologna's Orto Botanico (Botanical Gardens) have been enlarged and improved and today contain more than 5,000 plant species. The Orto Botanico (Botanical Gardens) are the second largest park in the city with many established plants, such as a fully grown sequoia, a greenhouse for succulents and insectivorous plants, tropical specimens, Mediterranean shrubs and a number of medicinal plants.